Since 2009 Fallah Productions Inc. and Windy City Poker Championship Inc. have worked to market and promote quality poker tournaments that are designed to not only generate more revenue for the hosting charities…but give amazing opportunities for local players to compete for large first place prize packages on national TV against their favorite professionals and celebrities. WCPC works with local charities to raise the bar here in Illinois when it comes to charitable poker events. As a marketing and promotion production company, the Windy City Poker Championship helps draw more players, bigger buy-ins, and major opportunities for everyone involved. These events give the best value for the players $, while finding a perfect blend between boosting local economies, increasing charitable fundraising revenues, and adding to local players bankroll! WCPC guarantees the best experience, tournament structure, and opportunities! We are helping to build a poker community here in Chicago and look forward to having you participate in a variety of events in 2014 and beyond. Curious to know where we came from…??? Below is our story that brought us from the beginning to where we are today! The Windy City Poker Championship’s first few events which were organized by Main Event Charity Games were held in downtown Chicago at Grace O’Malley’s and featured low buy-in tournaments and fun structures. Never before had a poker TV show offered a televised event with a buy-in of $150 or less. This new opportunity gave local players a chance to win something for themselves and have fun on TV. The show which was hosted by Executive Director Kirk Fallah and Q-BBQ President Michael LaPidus began broadcasting on Comcast SportsNet Chicago in prime time with replays. Quickly the program generated broadcast success with additional networks picking up the episodes. This success would help spark more televised charity poker events organized by Main Event Charity Games. The additional events at the Cactus Club in downtown Chicago, Grace O’Malley’s, and Chief O’Neill’s had a unique feel to the broadcasts....they felt like a regular home game! We also had a chance to meet great local players and personalities wjp would shine bright on camera. Players including Aaron Massey, Jason G-Boo Goodman, Jerry Gumila, Tattoo Tim” Tim Bailkowski and many more! Windy City Poker Championships first major main event came in December of 2009 at the Irish American Heritage Center on the north side of Chicago. Helping raise money and awareness for the H-Foundation, this $365 event featured 180+ players and a 30,000 chip deep stacked tournament. This event was a special one for Kirk Fallah as it was the first attempt to have a Televised Feature Table and Final Table from a main event. Never before had a charity poker tournament had a feature table which began at the beginning of the tournament. This feature table was stacked with professionals Bernard Lee and Dennis Phillips. Local professionals and players included Dave “Fishy Fish” Backstrom, Aaron Massey, Brian Ehman, Paul Fisher, Chicago Joe, Chicago Jason, WCPC Host Kirk Fallah, movie critic and WLS-890am host Richard Roeper and many more. These players were playing on a brand new TV poker table designed by Ted Leahy at www.luckyleahys.com. With a leather rail, pocket cameras and a sleek looking speed felt…these players were having a blast throughout the televised action! The Final table of this event featured co-creator of the Windy City Poker Championship Dave McDermott, Local professional Ken Felten, and eventual Main Event Champion Leroy Carver. When the program hit the broadcast airwaves…more sponsors…players…charities…and networks wanted to be involved and connected with Windy City Poker Championship. This gave Kirk Fallah the idea of expanding the events to offer more tournaments, bigger buy-ins...and more opportunities. 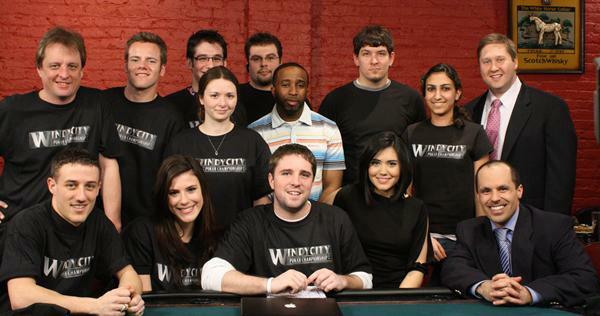 2010 was a banner year for Windy City Poker Championship. Growing to expand the televised championship too include multiple TV events and opportunities to players. In November of 2010 there were 3 different televised events. The first event which helped raise money and awareness for the Pediatric Oncology Treasure Chest Foundation was a heads up championship where 14 of 16 players were featured ON TV for the heads up action. The featured match-ups included 2007 WSOP main event champion Jerry Yang vs. Richard Roeper. St. Louis professional Scott Clark vs. WPT Boot Camp professional Nick Brancato, Poker professional Mark “Poker H0” Kroon, and the eventual champion 2009 WSOP-C champion Josh Shmerl. The next featured event was another first for televised poker. Helping raise money and awareness for Shady Oaks Camp in Homer Glen Illinois…the main event which was a multi-day, multi-month, multi-flight event featured a Day #1 Feature Table with Faraz “The Toilet” Jaka butting heads with 2007 WSOP Champ Jerry Yang. 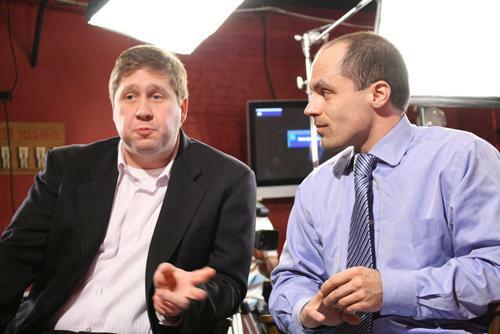 There was also a Day #2 Feature Table hosted by Ante-Up Magazine’s Scott Long and Chris Cosenza where Kirk Fallah mixed it up with local Chicago rounders…many of whom had never been on television before. The Final Table Hosted by Jason Finn and Kirk Fallah included Leroy Carver who was looking to defend his main event title. Leroy ran into Quad’s against our eventual champion Michael Sabbia who played a tough heads up match against Ted Leahy from Lucky Leahy’s poker tables. Once that event was finished it was on to a new program that Kirk Fallah designed. This program was going to up the ante for the Windy City Poker Championship by having a $1,500 buy-in winner take all event. Hosted by Jason Finn and CSN Chicago’s David Kaplan…this table was stacked with characters and touch competition. Featuring Jerry Yang, Mark Kroon, Nick Brancato, Richard Roeper, Scott Clark, Gary Carr, Kevin Boyd, Ted Leahy, and Dave Backstrom. When all was said and done Nick Brancato defeated Jerry Yang heads up to take down our first event and put a cap on a wonderful charitable series. In 2011 Windy City Poker Championship stepped up its game. Coordinating with Rockford Charitable Games and the H-Foundation. WCPC helped put together a December event that brought more amazing poker action to broadcast Television. The main event featured 150+ players competing in a 30,000 chip mega deep stacked structure. This event brought in professionals and celebrities from all over the country. Poker Professionals including Downtown Chad Brown, High Stakes player Rick Rahim, Poker Pros Amanda Musumeci, and Jamie Kerstetter. The final table featured a familiar face…co-creator of the WCPC David McDermott. Interestingly enough he was joined by his son David Jr. This story line was amazing as David Jr. played his first ever live event a few days prior to the main event. David Jr. ended up winning that Ante-Up Championship event defeating his father heads up for the title. Now they were both at the Final Table and looking for more success. This final table was tough competition with players such as Kris Karambinis, Jim Casement, and Neal Jacobs. In the end amateur player Tony Parille took first place becoming our third Main Event Champion. For part of his first place prize, Tony opted to take a WPT Jacksonville package valued at over $5,000 to play at the Bestbet Poker Room in Jacksonville Florida…Tony ran deep in that event taking home an additional $20,000 for his efforts. Not too shabby for a $300 buy-in charity poker tournament! Following that main event was another $1,500 Winner Take All Sit-N-Go. This SNG had some new fresh faces, and some familiar professionals. 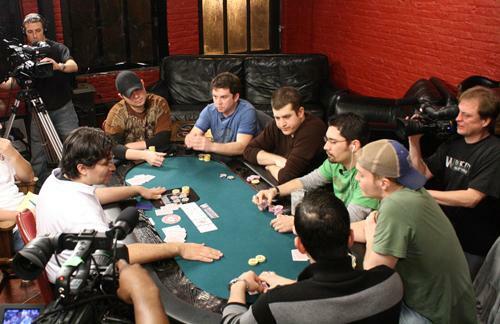 The table featured pro players Faraz Jaka, Chad Brown, Jerry Yang, Nick Brancato, and Rick Rahim. Amateur players included Bustout Poker’s Nikki Griffith, Paul Fisher from Danley’s Garage, WLS-AM radio host Richard Roeper, CSN Chicago’s David Kaplan, and our amateur qualifier WPT Boot Camp Student Meg Bertini. Meg won her seat to this event in a $75 qualifier. In the end Faraz Jaka defeated Paul Fisher heads up to take down our second Winner Take All SNG. The events finalized with two fun heads up matches. Faraz Jaka and Jerry Yang played for bragging rights while Kirk Fallah and Nick Brancato played for jobs! In the match-up between the Pro Nick Brancato and the fish Kirk Fallah viewers saw a Joker’s Wild Hold’em and Pineapple match. If Nick Brancato won the best of three he would be the host for the 2012 Windy City Poker Championship broadcasts with Jason Finn, if Kirk were to win the match then the WPT boot camp would come to Chicago during one of his events. With a total lack of any skill and all luck…Kirk Fallah took down the heads up match and kept his job! Thankful for the opportunity to not only continue to host the show…but also to bring the World Poker Tour Boot Camp here to Chicago. 2012 saw WCPC going back to its roots of offering low buy-in deep stack televised events. In June of 2012 working with the American Legion Tinley Park Post 615. 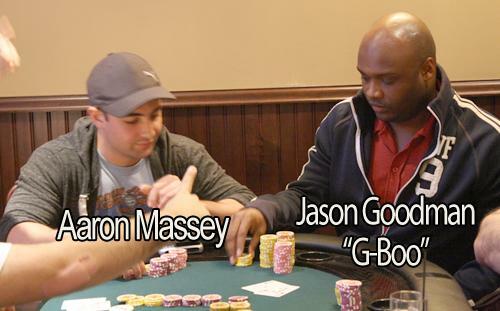 WCPC hosted a $250 deep stacked main event hosted by Jason Finn and WSOP-C Champion St. Louis Pro Scott Clark. The final table was one of the most entertaining to date which featured some familiar faces. Gary Carr and Dave Backstrom returned to the TV table. New faces included Stephen Kidder (Stephen was featured in the 2010 Day #2 main event), Harry Mohebbi, Mike Kleinstub, and Ryan Hickey. In the end Dave Backstrom would somehow take down the event after an early tough beat leaving him with only 2 big blinds. 2013 brought back some oldies but goodies, and added new events to the televised broadcasts. In April of 2013 during one of the biggest rain storms to hit the Chicago area in a long time…the Windy City Poker Championship teamed up with Shady Oaks Camp and the American Legion Tinley Park Post 615 Auxiliary to put on two televised championships. The first was a $1,000 Heads-Up event where the winner would claim the final seat at the televised $3,000 Sit-N-Go. This heads up event featured many local professionals you may not have heard of yet. Players such as Eddie Ochana, Robert Edelstein, Ryan Leng, James Snyder, Pawel Andrzejewski, Nick Jivkov, and Mike Parisi. The first featured match held WSOP Bracelet winner Nick Jivkov vs. Rick Rahim, Nick would move on to the next round where he was defeated by eventual champion Pawel Andrzejewski. The second event which was the biggest and craziest event ever on the Windy City Poker Championship was the Televised $3,000 Sit-N-Go. This tournament offered a $1,000 one time only re-entry/surrender your stack option which juiced up the prize pool. Featuring Richard Roeper, Aaron Massey, Ron Magers from ABC7 Chicago, 2003 Main Event Champion Chris Moneymaker, 2013 WCPC Heads-up champion Pawel Andrzejewski, WPT Boot Camp pro Nick Brancato, WPT Boot Camp students Don Bates, Lloyd Mandel, Mike Steinberg, and Gary Carr. Yes Gary is back making his 3rd appearance at our TV table. Gary defeated Geno Francione heads up in a Satellite for the 9th seat at this amazing event. Back and forth the chips flew early on with 4 players needing to reach back into their pocket to re-enter this tournament. Once the prize pool was closed the players settled down to try and take down the first place prize packaged valued at $17,700. Second place was going to take home a package worth $7,500, and third place (due to the re-entries) would break even with a $3,000 prize package. Eventually the man who started the poker boom Chris Moneymaker would defeat Don Bates to become our latest WCPC Champion! The goal for 2014 is to start the “Windy City Poker Tour”. This tour will travel all over the Chicago area and offer the best tournaments and best structures you will ever find. That is just a glimpse at what is in store for 2014. We hope to see you at one or more of the events having fun, helping out local charities, and becoming a part of something great!